The couple said they lost a field of cucumbers as well as other produce. McBarnette disclosed that he owns over 13 acres of land above Bigger Trucking and Blocks Construction Company Limited Rabacca Project, where sand mining is carried out. The couple said their problems with the company, as well as those of other farmers, started about two weeks ago. âBefore that everybody was going cool,â said McBarnette, adding after the December 13 General Elections things changed. McBarnette and DaSouza explained to SEARCHLIGHT that the road to get to their lands was on Government lands, but this area was enclosed by Bigger Trucking and Blocks Construction Company Limited when it started its operations in 2008 and farmers were told to pass through the main gate of the mining site. He said the previous road had been in existence for over 25 years. McBarnette stated that instructions were given two weeks ago that farmers enter the mining site via the gate at 7a.m. and exit by 4:30p.m. âBefore that, we never had that kind of problem. We just use to pass up and down,â said McBarnette. McBarnette and DaSouza said two farmers who came from their farms late were trapped inside the project site when they met the gates locked. âFrom the time he start to react, farmers started to react too, because that is people livelihood,â said DaSouza. âHe could get no truck go up by he either, because he lock the gate from we to go to our farm and then we block the road with truck, because he canât get no truck go by he either for sand,â said DaSouza. âRemember he have workers to pay, so he use to feel it more than we. When the workers them go to work, he have to pay them. So everybody bin ah lose,â said DaSouza. McBarnette and DaSouza told SEARCHLIGHT that a farmer became quite frustrated when he was blocked from accessing the route and got involved in a fight with Samuel, during which several blows were exchanged. 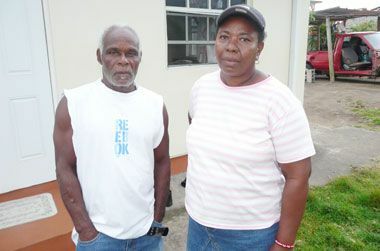 The couple said the police were called in to quell the broiling tension in the area.